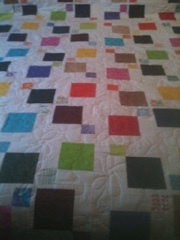 Yesterday, I took the second quilt off of the new Coronet...loving it! This is a mid size quilt( 70x90), roughly. I did a funky, freehand flower all over quilting pattern, which went very well. I am getting quite comfy with this machine now. This is on the bed...spread out, but poor lighting. This is over a chair with a peek at the back. I am very happy with this quilt. 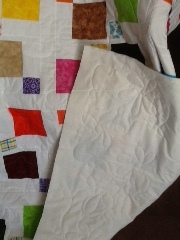 Now, I am focusing on the customer quilt that I am hand quilting...and piecing new ones. I have one started and three new orders in. Hubby has been reacquainted to the sewing room!!!! The quilting looks great, Marjorie. I can tell you are enjoying the machine.